Baby Bouquet A new baby brings much joy and all of our baby bouquets are reflective of this happiness. Choose a baby bouquet that oozes happiness and festivity, the emotions that are inextricably linked to the birth of a new baby. 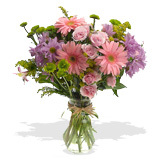 We are experts at creating the perfect arrangement to compliment the occasion. Our in-house flower experts arrange each bouquet with the utmost care and we send our flowers via FedEx to guarantee correct arrival date.